The Act is a complex matter and we invite you to telephone our office to discuss your situation and responsibilities under the Party Wall etc. Act 1996. This telephone service is free for up to 30 minutes and without obligation. 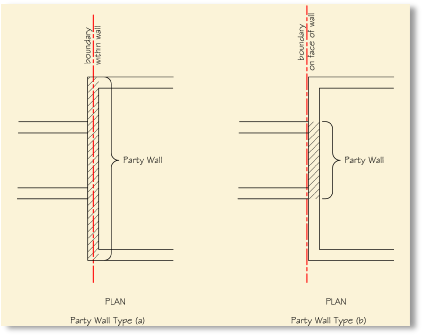 If you pass your curser over the diagrams or buttons, further explanatory text will give you more of an insight into the Act. Do I Need to Serve Notice Under the Act? 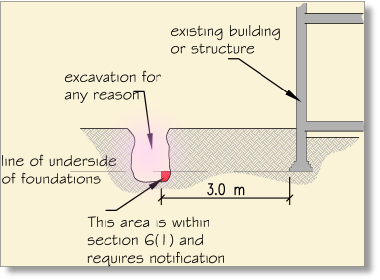 You intend to excavate (for any reason) within 6.0m of an adjoining owner’s building or structure where the depth of the proposed excavation would be lower than a 45 deg line drawn down from the junction of the adjoining owners wall and the underside of their foundation. You will need to follow the procedure as laid down by the Act which, if you pass the mouse over the ‘Procedures’ Box, will give you more detail . The “Building Owner” is the party proposing to carry out any relevant works and is required to give prior written notice of his proposals to any adjoining leasehold and/or freehold property owner (there may be several) of whom each is known as the “Adjoining Owner”. If consent is given then we still recommend that a schedule of condition be taken prior to the commencement of works for comparison on completion to determine if there has been any damage as a result of the relevant works. 3. to disagree but both parties concur in the appointment of one Surveyor (who will act totally impartially) and known as the “Agreed Surveyor” who will produce and Award as item 2. If the AO fails to respond within 14 days of the date of service of the notice a Surveyor may be appointed for him by the BO and the matter proceeds as item 2 above. 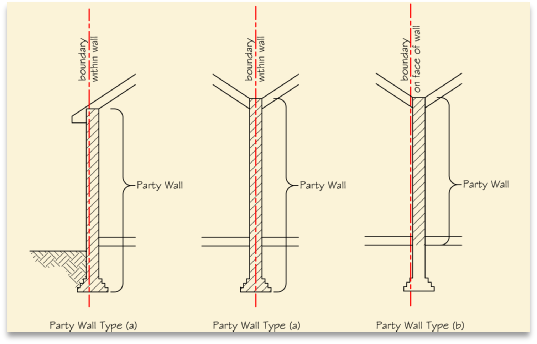 If the procedure is as item 2 then the two surveys select a Third Surveyor in the event that they cannot agree on some items or if one of the surveyors is unable to proceed. If the Third Surveyor is called upon his/her decision is final. 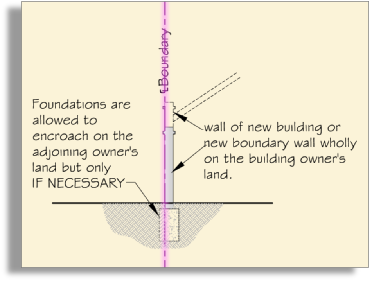 In all normal circumstances, the fees of all/any appointed Surveyors are paid by the Building Owner, although this could be changed by an Award from the Third Surveyor when settling any dispute. The Building Owner is required to indemnify the Adjoining Owner against the possibility of damage that might arise as a result of the relevant works either accidentally or by negligence and the schedule of condition mentioned above is used to determine if any such damage has occurred. In all cases it is to be encouraged for the BO and AO to agree matters. The Act gives rights to both the BO ad AO and cannot be used to prevent works that are lawful. If you are certain that your neighbour (the “Building Owner”) is acting in a way that requires action under the Act but has not followed it, you should seek an injunction from the County Court. This will take the form of an application for Interlocutory Relief which will be heard by a judge who will listen to your concerns but, on granting the injunction, will require you to give a cross-undertaking in damages i.e. if there is no infringement then you will bear the costs of the Building Owner. 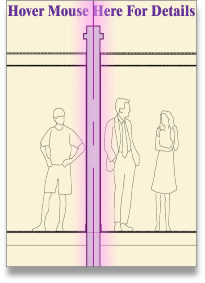 This is a wall which stands astride the boundary, not necessarily centrally, and not just with its footings on next door’s land (as shown in line of junction diagram). So much of a wall not being a wall referred to in paragraph a. Above as separates buildings belonging to different owners. 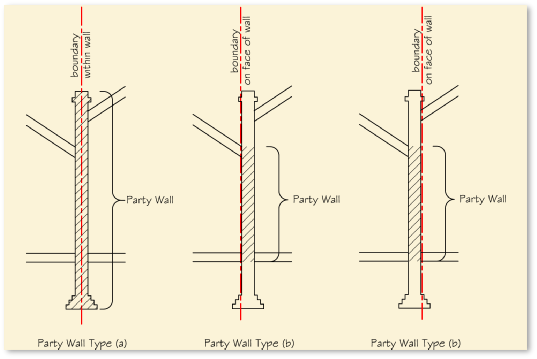 This is a wall which separates the buildings of two owners, but only that part of the wall which actually separates the buildings of two owners is deemed a party wall.